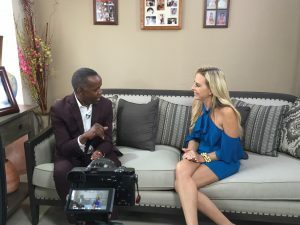 Host Karyn Turk sits down one on one with the Renaissance Man Dr Christopher Metzler to talk life, activism, politics, fashion and more. Author of The Construction and Rearticulation of Race in a “Post-Racial” America (2008), Dr. Metzler’s forthcoming works include Divided We stand: The Quest for America’s Soul (Post Hill Press, 2018). In the charitable sphere, he serves on the boards of The America Red Cross and The ARC. He also works tirelessly at All Saint’s Soup Kitchen in Fort Lauderdale, FL providing meals, clothing and other assistance to the homeless. Educated at The University of Oxford in Oxford England and Columbia University, he is a member of both Oxford University and Kellogg College at the University of Oxford. Dr. Metzler obtained a Ph.D. in International Legal Philosophy from The University of Aberdeen. A former faculty member at Cornell University, he was a professor at Georgetown University where he also served as Senior Associate Dean of Applied Management Degrees at Georgetown University. Today, he is a Senior Fellow at the Thomas Jefferson University Institute of Emerging Health Professions — home of The Sidney Kimmel School of Medicine. A seasoned, conservative political operative, Dr. Metzler has worked on major political campaigns providing appropriate messaging and strategic advice as a direct link to the governing party as well as the Republican party. The ultimate global Insider, he has become one of America’s trusted crisis managers by flying under the radar helping Politicians, World Leaders, Sports and Entertainment figures, and other high-profile individuals in difficult situations. Since the start of his career in 1992, as a Legal Scholar, Dr. Metzler has worked in over twenty countries providing advice on Geopolitics, emerging markets, International Law, International Humanitarian Law, Diplomacy, and related topics. He is frequently called upon as an expert witness in state and federal courts on legal issues and travels extensively speaking to colleges, private organizations and businesses throughout the United States and abroad. A non-Executive Chairman in the global healthcare enterprise, Dr. Metzler’s business portfolio spans wide in the medical and Management Consulting fields, where he is CEO of Gordium HealthCare, City Place Pharmacy, Next Generation Labs, JMI Consulting, Medicine on Wheels, 911 Urgent Care, FHWFIT, and others.